Welcome to another episode of the Stopwatch Gardener podcast, where this week I’m rushing about the garden like a mad thing, getting excited about every early-spring plant and the very first humming bumblebee of the season. I also take a minute to remember my lovely, much-missed dog Lizzy as I look at the place in the garden where she was buried a few years ago. 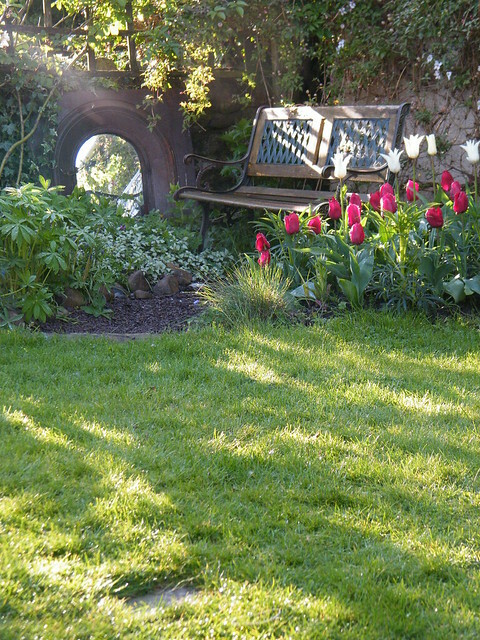 I’m delighted that Crug Farm has joined Beth Chatto, Vanessa Mann and Frank Kirwan to donate plants to my Rare Plants for Rare Disease fundraiser for neuroacanthocytosis research on 24 May 2014. If you run a nursery, especially if you trade in rare or unusual plants, I’d love to ask you for a donation to this worthy cause. Contact me here if you can help with a rare plant donation. Have you voted for the Scottish site to win a wildflower transformation? The Sarah Raven special a couple years ago about Bees, Butterflies and Blooms opened my eyes about the need for more pollen and nectar-rich flowers for bees and other pollinators, and the viper’s bugloss I planted in the garden last year were, along with my oregano plants, complete magnets for all kinds of beautiful insects this summer. I’ve become as excited about bees as I became about frogs after getting over my initial queasiness about them. Big community spaces have a huge role to play in supporting insect life, so if you are reading this, please could you take a moment to vote in the Grow Wild competition? Three sites across Scotland who’ve submitted plans for new community gardens have now been shortlisted to win a £100,000 Grow Wild transformation, supported by the Big Lottery Fund: the transformation of the winning site will include large sowings of UK native wildflowers. The shortlist of sites in Greenock, Livingston and Barrhead has been put together following a call made to people to nominate a site in their community that would benefit from a Grow Wild transformation. The judges went through submissions from youth groups, community associations and residents groups, artists, high school design students, and landscape architects, who’ve pulled together some inspirational plans, and the three shortlisted Scottish projects now need your vote. There are only a few days left to vote, so please cast your Grow Wild vote here, where you can also read more about the three shortlisted sites. Leave a comment on this blog, or re-tweet my tweet to let people know you have voted, and I’ll put you in a draw to win a gorgeous afternoon tea for two at Edinburgh Botanic Gardens or Glasgow Botanic Gardens. Have you voted yet? Go vote! Voting runs until midnight on 3 November and the winner will be announced in mid-November. Don’t forget to leave your comment below, or re-tweet my tweet letting people know you voted, and I’ll put you in the draw to win the gorgeous afternoon tea. UPDATE: Thank you to everyone who voted – Waterworks in Barrhead won the Grow Wild £100 000 funding! Almost 20,000 people across Scotland voted for the three projects in total. Thanks so much to everyone who spoke up to have their voice heard on this vote. I have a patient family. 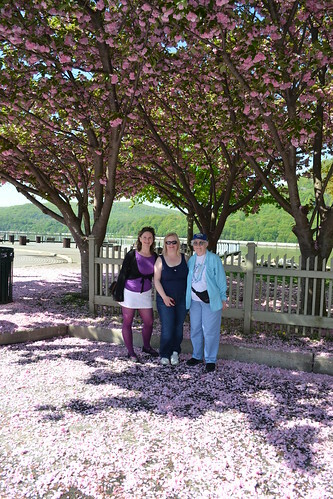 My sister and mother have agreed to devote our annual Girls’ Week holiday to visiting the gardens (and a few wineries) of the New York area – Stonecrop, Innisfree, The Mount and a few others. In practice this means they walk about with me a little bit, photographing a few tulips or touring the gardens’ adjacent historic properties, then they sit in the car reading and knitting and letting me ogle plants. I’ve promised we can do Munich next year, which may bring the alcohol-horticulture ratio into a fairer balance. It is spring in New York, which is weeks ahead of where I live in Scotland. 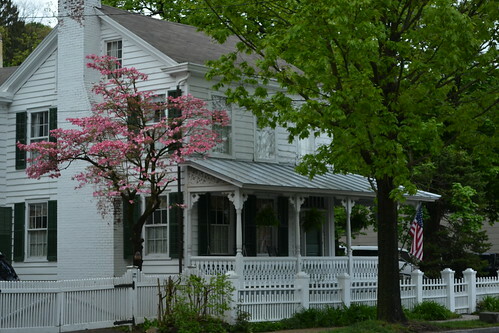 The cherry blossom and dogwoods are over-the-top beautiful, great clouds of perfume are rising off the lilacs and the hostas are well-unfurled. Wisteria – which grows as wild and indifferently as buddleia – has draped its grape-bunch flowers at roadsides and over derelict buildings and along the front porches of houses whose owners don’t really care about gardening. about gardening. A neighbour looking at another’s property is more likely to admire the giant gas barbecue or the new Prius in the driveway, or perhaps the most prized plant in American gardens, the well-watered lawn. 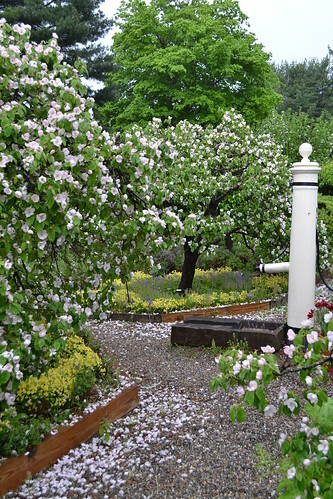 But there is a passionate minority who care very much: like the 3,000 NGS-style gardens that open annually, or like the Philipstown Garden Club, who tend Boscobel House’s historic herb garden with only heritage varieties of fruit, herbs and flowers. The large but light-touch blossom of the Boscobel quinces has made me realise how much I need one in my garden near Edinburgh. 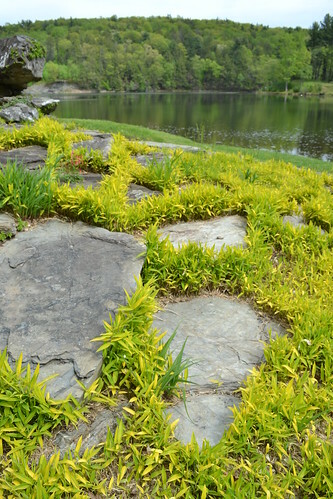 You can see more Boscobel garden pictures here. With so many municipally planted cherries and cornus and red-pink cercis, there is a magnificent show even without fanatical gardeners on every street. The flat-faced cups of the white dogwoods are my favourite, but I love the way all the cornus rise up towards the light in what is a heavily wooded landscape here: houses are all detached, unlike in Scotland, and trees crowd in everywhere, between houses and behind grassy back yards that trail off into the ever-present woods. I grew up near Boston, and these wild, uncultivated woods are what strike me most when I come back. In Scotland, every scrap of roadside land looks to me to be farmed or inhabited. It’s a great contrast to the acres of idle scrubland along New England roadsides: thousands of trees grow upright or lean against each other from storms, or stand dead and bleached in the ponds that appear here and there. The wildlife must love this, I keep thinking: so much water, so much cover and wild food. Bill Bryson, another American who like me has an unusual perspective on the US as a long-term ex-pat, has noted this, too: there is a impressive amount of wild nothingness here in the New England woods. In such a landscape, hand-crafted spaces like Stonecrop Gardens have an altogether different feel: this isn’t the crowded UK, where hiving off a bit of land for ornamental gardens can seem almost indulgent. Stonecrop, which is the former home of Garden Conservancy founder Frank Cabot, is marked by a simple sign along the endless treescape of the main road through upstate New York. It feels like the woods have been forcibly pushed back to allow this stunning space to breathe in the landscape. The views over the Hudson River Valley are memorable, and frankly compete with the expert planting, which I think I photographed from every angle. I loved how emerging herbaceous plants were blended with generous swathes of tulips, and a great lawn dedicated in part to ferns and lily-of-the-valley help the garden blend well into the woods beyond. More Stonecrop Gardens pictures are here. A separate woodland garden at one side of Stonecrop is the best I’ve ever seen. 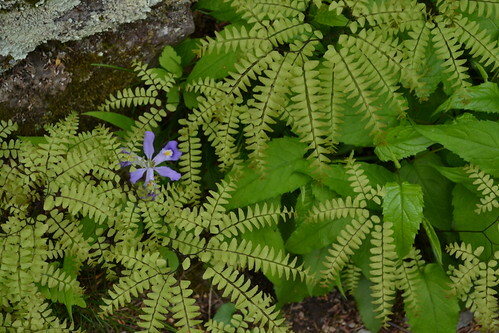 So many plants I didn’t know – caulophyllum thalictroides, mertensia virginica, glaucidim palmatum, plus simple, dark-stemmed adiantum ferns I fell in love with – in well-planned beds (I remember seeing one labelled “Woodland Bed 10”) that have been labelled with up-to-date Garden Tour markers. I haven’t visited a garden that has such a well-planned Garden Tour – a printed list that’s given to every visitor. One of the head gardeners prepares the list by walking the garden every week or so, and figuring out the ideal route to take at the moment, moving numbered labels to mark current star plants. This walk is written up on the tour, with a numbered list of star plants, including the Latin and common names and plant family of each. Phew! “It’s a lot of work, but it’s worth it,” one of the nice ladies in the potting shed told me. I bet it’s worth it for them, too – they can get on with propagation and planting without identifying the same plant for thousands of visitors. We left Stonecrop, later to be given tea and biscuits by the wonderful Lisa-Ann and friends at the Garden Conservancy, which is like a cross between the National Trust and the NGS in the UK: the Conservancy both preserves historic gardens and encourages private home owners to open their gardens, a bit like the Yellow Book, but as 100% fundraiser for the Conservancy’s work. Meeting the Conservancy folk and seeing jewels like Stonecrop convinced me that gardening isn’t a fringe activity here, there really do exist my kind of people, who would drive hours to peer at an interesting planting concept – like this cool idea at Innisfree Gardens below: flat stones interplanted with what I think is hakonechloa macra aureola. But I do get the sense that fanatical gardeners exist, much like that grass, in tiny, fertile pockets of land in an otherwise indifferent environment in America. The television last night showed us a parade of intriguing things, including an advert for a steakhouse that promised to drape their bacon burgers with extra bacon nuggets (“At Longhorn Steak House, we don’t just do bacon, we do bacon-on-bacon”), and a food show that tours the greasiest diners in North America, serving dishes like butter-topped burgers and chicken that has been double deep-fried (don’t ask). But more memorable than the cuisine was how gardening is portrayed. Adverts lean heavily toward the chemical, advising which weed killer to pour on your flower beds, and which bedding plants to buy now so your garden will appear instantly full: I think it was an advert for a home store selling flower-towers of impatients and petunias. No waiting, no gardening, just add water – a bit like pot noodle, when all you want is that full feeling, and taste doesn’t matter. 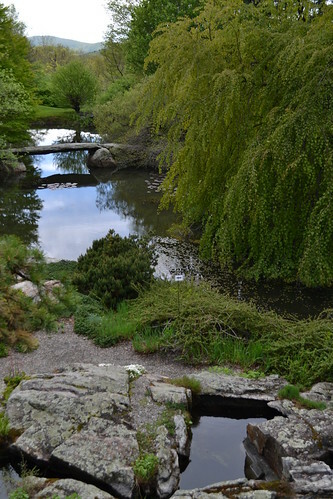 Today we’ll see something we haven’t experienced yet: two Open Gardens for the Garden Conservancy, both in New York, including the garden of Margaret Roach, who produces the A Way to Garden podcast that made my top 5 a few weeks ago. Margaret writes in her blog about her organic methods and grow-your-own ideas, and she is always careful to say that her methods aren’t the only way, but just “a way” to garden. I guess she’s trying to inspire, rather than dictate. Seeing the environment in which gardens are made here in the US, I think a little inspiration can go a very long way. What were your impressions of the gardening culture when you’ve visited other countries?